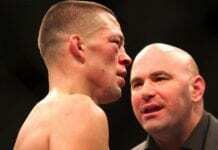 The 170lb main card fight between Nate Diaz and Marcus Davis had been predicted to be a potential ‘Fight Of The Night’ candidate at UFC 118, and there was plenty of fireworks and no shortage of blood on display here. Davis started fairly well in the stand-up battle, but before long Diaz began to find his range and use his height and reach advantage to his benefit, peppering his opponent with combinations. Davis face quickly began to show the signs of damage with blood streaming from a cut above his right eye, and later from his nose. As he continued to lose the striking battle in the later rounds the former professional boxer had to resort to leg kicks to land anything meaningful, while Diaz persistent strikes caused severe swelling around Davis right eye. In the final minutes of the fight with Davis wilting, Diaz finally took the fight to the floor and finished with a guillotine choke. It was an excellent performance from Diaz who picks up his second win at welterweight and moves his career record to 13-5. Meanwhile the signs are that age may indeed be catching up with Davis as he slumps to his third loss in four fights to go 17-7.